Dave and Steve, We are so sorry to hear about your mother. What a women, that's all I can say. What a gracious and loving woman. I thoroughly enjoyed working with her and with Bob when they were at the Square. She always had a ready smile and god word. My thoughts and prayers are with you and your families. The Krca family would like to express our condolences to Norma's family. Norma was a wonderful person and you all had the good fortune to have so many loving years with her. Please except our sympathies, you are in our prayers and thoughts. 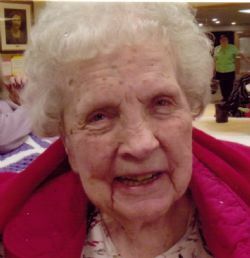 Barb - sending our sympathy & love to you and your family on the loss of your Grandma.